Pelicans, seagulls & coots are flying in to the San Clemente Pier from all over and are performing a beautiful aerial ballet as they all dive for fish. As hectic as it seems it is amazing that all of this is done without any collisions or birds going for the same fish. Beautiful to watch. 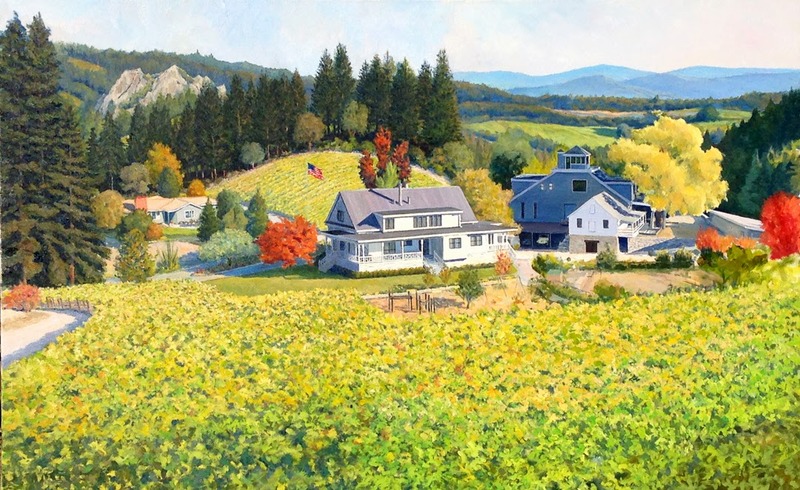 The Yates Family Vineyard in the Mount Veeder area of Napa and the historic Napa Castlerock are featured in this soon to be completed painting by Paul Gavin. This elegant family run winery is the site of the original Castlerock Winery that has become the Yates Family Vineyard operations center and tasting room and artistic license used to move the prominent and historic Napa Castlerock, which is on the property, a little to the right so it appears in the composition. Check out the Yates Family Vineyard for your wine and event needs and opportunities. 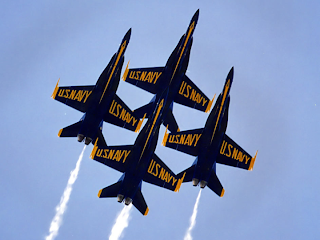 The US Navy Blue Angels have published their 2014 Air Show Event Schedule. Southern California Air Show fans can look forward to NAF El Centro March 15, Palmdale March 21-22 and Fontana March 23, and the 2014 MCAS Miramar Air Show October 4-5. All will probably depend on whether the shows can gather enough support to cover all the expenses. Let's hope so. You can still get the now classic collectable 2013 MCAS Miramar Souvenirs including Air Show T- and Hooded Sweat Shirts, Hats and Posters - featuring the F35B, the Marine Air Ground Task Force (MAGTF) and the Patriots Jet Team - a very limited edition design! Today, Sunday November 24, 2013 marks what would have been Fr Serra's 300th Birthday. Kimberleigh will be at Mission San Juan Capistrano as they celebrate with a Historic Bell Ringing at 12:00 noon. She will be signing her California Missions, Fr Serra Legacy wearable art pieces. Hungry? The San Juan Capistrano Mission Docents are serving a "Padre's Breakfast" of Mission Bread and Hot Chocolate - FREE - as long as it lasts! The Mission is a beautiful place and it will be a gorgeous day. Join Kimberleigh and everyone at the Mission as they commemorate this day. Here's how to get there. 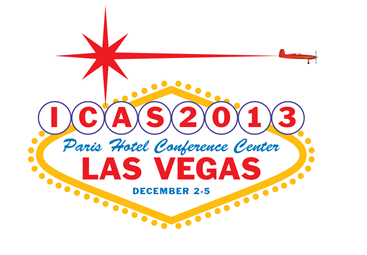 Air Show Fans: The 2013 International Council of Air Shows (ICAS) Convention is Dec. 2 - 5 at the Paris Hotel in Las Vegas. 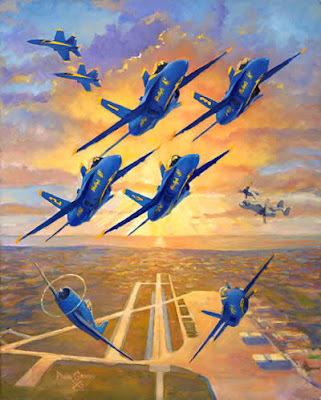 Paul Gavin will be there displaying recent Gavin Arts air show creations including the MCAS Miramar Air Show and the (sold out) 2013 EAA Oshkosh AirVenture design. The Gavin's are the leading producers and have created more different Air Show and military event images than any artists over the last 29 years. The event is a who's who in Air Shows where you can meet the military jet teams and performers such as the US Navy Blue Angels, the US Air Force Thunderbirds and the Canadian Snowbirds jet teams and the US Army Golden Knights and US Navy SEAL Leapfrogs parachute teams. All your favorite civilian performers are also present including Sean D. Tucker (who flies his Oracle Challenger III), Patty Wagstaff, Kyle Franklin and Julie Clarke. Although Sequestration continues there are plans that many of the larger shows may get U.S. Military support and get of the ground in 2014. Let's hope so, and if you are interested come to ICAS and witness the heart of Air Shows. 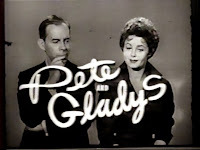 On November 22, 1963 when Kennedy was assassinated a unique impossible to plan coincidence occurred on television when the TV show "Pete and Gladys" had a "Special Bulletin" announcement happened just as the real one was broadcast on CBS Television. I was home sick from 4th grade class watching the show on which two couples had gone together to a Lake Arrowhead cabin for the night. They were not getting along, and wanted to go home. The camera turned to a radio on the show and from the radio came, "We interrupt this program for a special bulletin." Just then the entire screen went to a pattern in words stating "Special Bulletin". 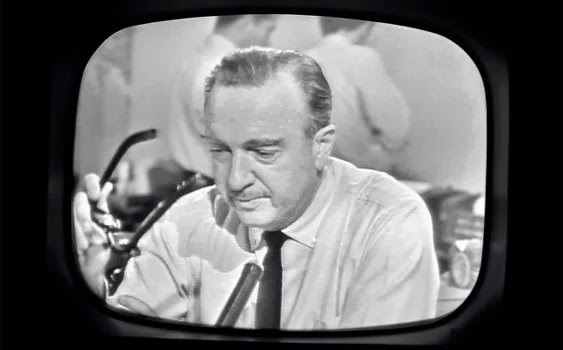 Shortly afterwards, Walter Cronkite came on and said "President Kennedy has been shot", and some details were given about the grassy knoll, etc. I remember thinking to myself "What if he dies?" I am not sure and think the show returned to the scene after the bulletin, and it might have been on for a while, but I do not remember much after that. It was not until a few years later that I finally saw the show without interruption. The episode was entitled Peaceful in the Country. The news bulletin from the radio was that there was a blizzard and no one could travel and hence, the couples would have to stay together and work things out. Being 10 at the time the social implications of that predicament did not stay with me. But I always remembered what happened and wondered if anyone else saw it, i.e. the timing was the same. A while later I learned my mother's sister Aunt Louise (Sally Lou) was watching the same show saying to me a while later, "Only you and I know what happened!" It is interesting but being so young while the political and global ramifications were way over my head, and what I remember most about that day was that amazing coincidence and wondering who else might have seen that. As an epilogue of sorts, on June 6, 1984 I met Walter Cronkite at Pointe du Hoc in Normandy, France. He was there for President Ronald Reagan's "Boys of Pointe du Hoc" Speech during the 40th Anniversary of D-Day events and celebrations. I was there doing paintings. I asked him to sign my trip book; he was very pleasant and said of course. He did and I still have that book. Kimberleigh Gavin joins Mission San Juan Capistrano's Fr Serra 300th Birthday Celebration Special Event this Sunday November 24, 2013 from 9 - 5. She will be signing her Serra Legacy Mission T- Shirts and Sweatshirts sold at the beautiful new Mission San Juan Capistrano Gift shop that opened in July. There will be many entertaining, interesting, educational and just plain fun events including a 12:00 noon Mission Bell Ringing at what Fr. Serra called "The Jewel of the Missions." Kimberleigh will be signing from 9 - 1. Want to have a special day at the Mission?You can arrange a personal tour for you or a group guided by an informed and delightful Mission SJC Docent. (Kimberleigh is one of these - as is Paul's sister Helen). Join the fun at this historic event. Directions? Click here. Come say "Hi!" to Kimberleigh at the Mission this Sunday and have her sign one of her beautiful Fr Serra California Missions T- or Sweat Shirts! The Gift Shop also has the elegant Fr. Serra 300th Birthday pins and charms. I read in the times that the A-10 Thunderbolt II "Warthog" (A10) may be on its way to retirement. Designed in the 70's around a pretty good sized Gatling gun, those who follow military aircraft know the power and capabilities of that aircraft and how essential it has been in protecting and supporting ground troops and armor. It exemplifies "Close Air Support". Kimberleigh and I had the pleasure of working with the A-10 and other aviation communities at Davis Monthan AFB in Tucson in support of their Aerospace and Arizona Days Open House and Air Show for a few years. We met many fine individuals at all levels in operations and support. One of these is LtCol Jill "Raggz" Long. (Look at her picture and guess the origin of her call sign) She flew A-10's and while still serving in the Air Force she finds the time to perform in Air Shows and this year she will be a featured performer at the 2014 EAA Oshkosh AirVenture. 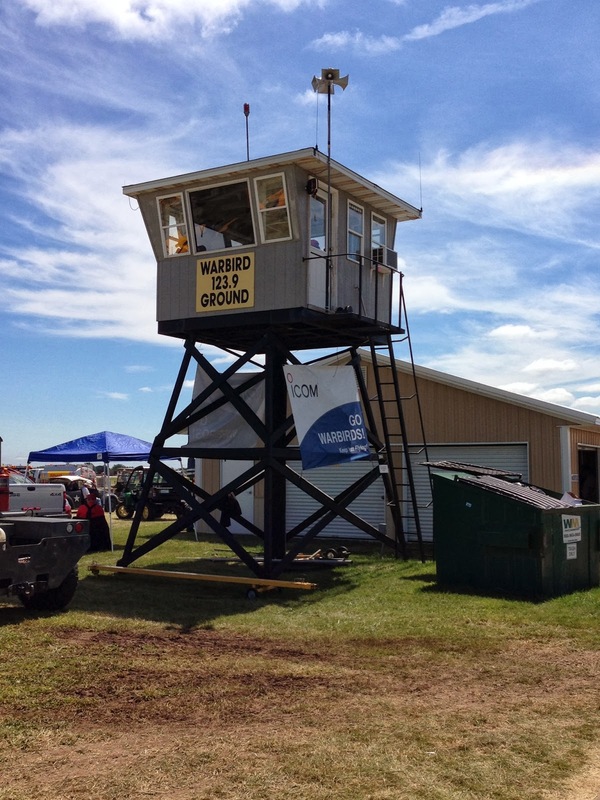 We are working on some 2014 EAA AirVenture at Oshkosh Designs at the moment and perhaps we will see her there! Jill in the "Ragged Edge"
The Blue Angels and Thunderbirds and other military demonstration teams are scheduled to participate in 2014 Air Show Season including the 2014 EAA Oshkosh AirVenture. 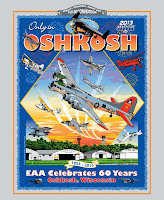 The Gavin's are already working with EAA on some 2014 Oshkosh AirVenture event design possibilities looking forward to a great event. 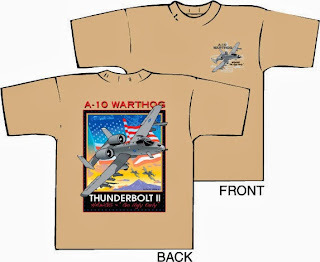 Stand by for updates and there are still a very few 2013 AirVenture shirtsavailable. Contact the Gavin's for more information. 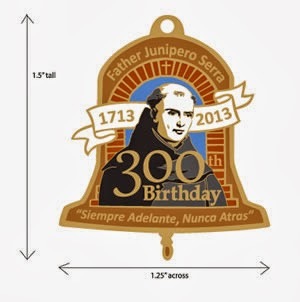 Father Serra's 300th Birthday, November 24, 2013 is one month away. Father Serra's 300th Birthday, November 24, 2013 is one month away. Kimberleigh created the celebration's signature designs and memorabilia to support the Missions (see the list) and events including the Huntington Library's Serra exhibit in San Marino, CA, and other organizations including Mallorca 2013. There are many activities still planned - some are listed on the California Missions Foundation web page. Read more about Kimberleigh's involvement and designs and if you are a California Mission fan be sure to get one of Kimberleigh's 300th Serra Birthday pins, pendants or the T & Sweat shirt with the Serra Mission Legacy design - the only one ever created with all 21 California Missions, their locations and founding dates on Kimberleigh's 300th Serra Birthday Page. 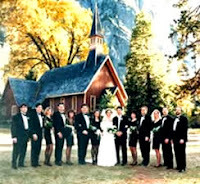 Yosemite National Park opened in time for the Gavin's 20th wedding Anniversary and possible return visit next week. 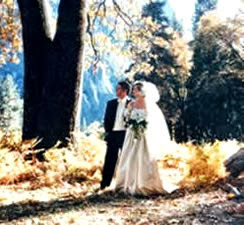 Yosemite played a big part in their lives, especially Kimberleigh's. 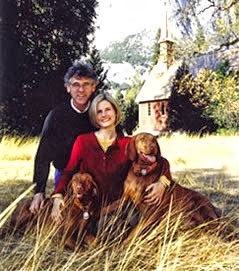 Married in the Valley at the Yosemite chapel, they returned each year for their anniversary, and when Vizsla's Claude & Chloe came into their lives they continued the annual visit, staying in dog friendly cabins. When Chloe died suddenly in 2009 they decided a change was best and began vacationing in the Eastern Sierra instead with Claude who passed in early 2012. This being the 20th Anniversary they decided it might be time again. Yosemite is also the subject of many of Paul's paintings and Kimberleigh's designs, including the Yosemite Hawaiian Design. Kimberleigh and Paul Gavin of Gavin Arts are pleased the Department of Defense and the US Navy have announced the Blue Angels will fly a 2014 Air Show Schedule. 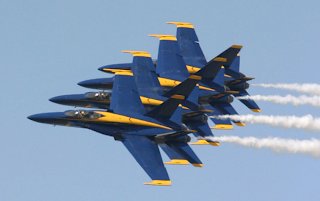 The Sequestration and its canceling of the Blue Angels, the USAF Thunderbirds and all military performance and even static display participation in air shows for 2013 caused many air show cancellations and dealt a blow to many individuals, companies and cities across the country and prevented individual military units from generating much needed additional funds for family needs and activities. 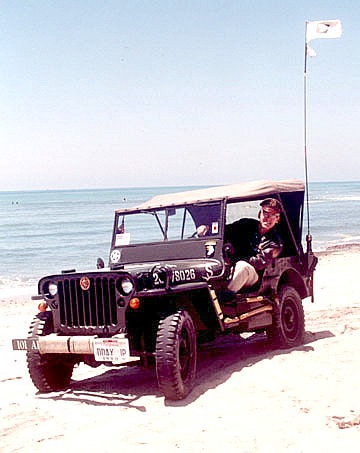 Paul began supporting military units and events in 1984 at the Blimp Hangars at MCAS Tustin, and Kimberleigh joined him when they married in 1993 with the 1993 MCAS El Toro Air Show and the 1993 25th Anniversary TopGun design and they have done it ever since. This will be good news if it actually happens. Let's hope it does. Kimberleigh walks into the fog on her early morning walk. Much moisture and thick mysterious atmosphere. 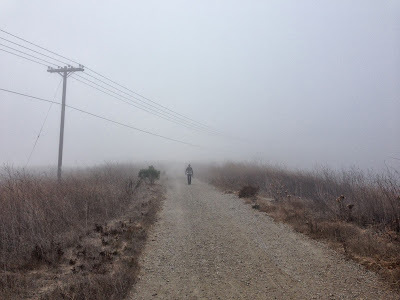 The mornings here lately have been very thick. At the top it's a different story. Makes for a good perspective and a better day. Note Saddleback in the distance. Kimberleigh's Gavin Arts 2013 Dana Point State Championship BBQ Design features over 100 teams as the event becomes one of the largest State Events. Teams come from all over the state and across the country to participate. 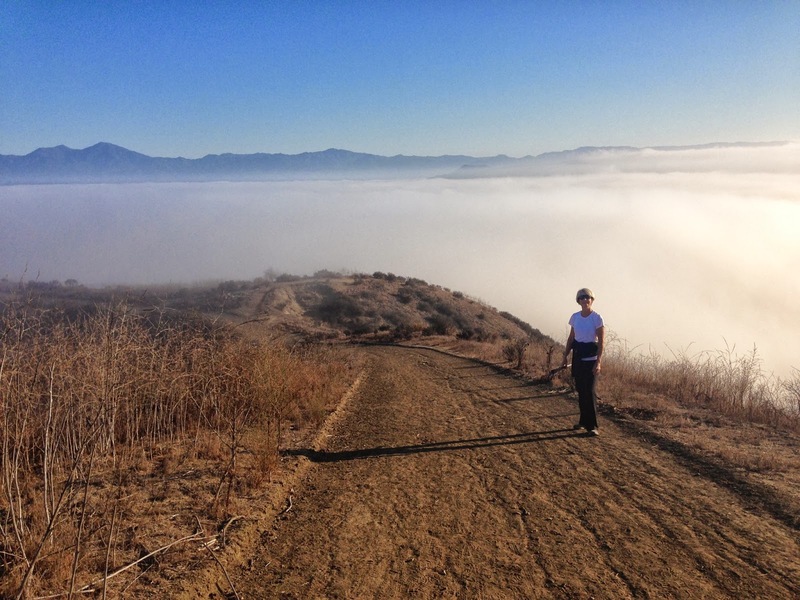 This event happened October 5, 2013, in the Sea Terrace Community Park, Dana Point CA. The whole neighborhood smelled wonderful and a great time was had by all. 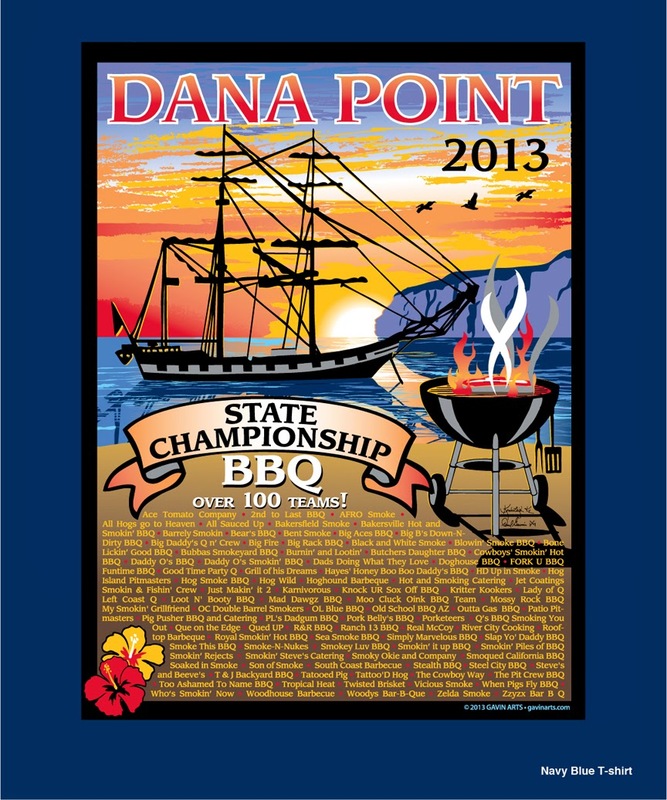 For more information about the 2014 event go to the Dana Point BBQ web site, and to get one of the few remainingT-shirts and hats go to the Gavin Arts Dana Point BBQ page. 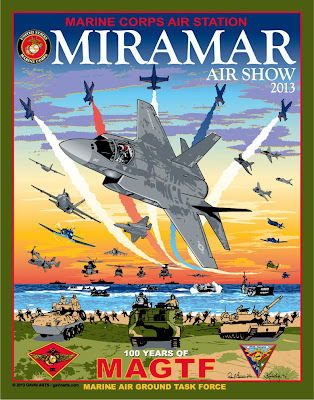 This Gavin Arts design was created by Kimberleigh for the 2013 Miramar Air Show T-shirts, Sweat Shirts and Posters. 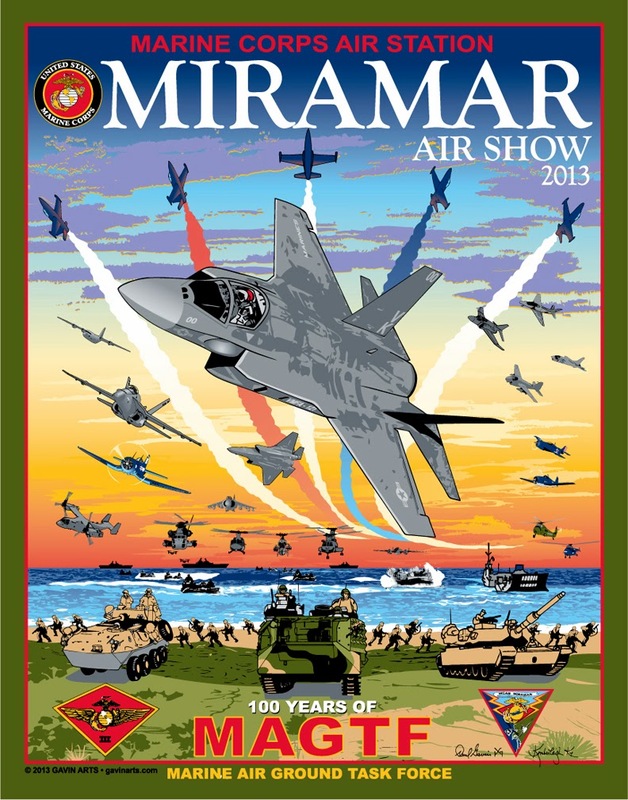 The 2013 Miramar Air Show was cancelled at the last minute. Because it was going to be a smaller show fewer than usual quantities of each were produced making them highly collectable. The image celebrates 100 years of MAGTF (Marine Air Ground Task Force) featuring the Marine Corps F35B version in the VMFA-121 Vikings markings (slightly edited - placed on inside of the tail to ensure it could be seen at this angle) and many historic and current air, land and sea elements of the Marine Team. The 5 jets leaving the red, white and blue smoke trails are the Patriots Jet Team who were scheduled to appear as the Blue Angels had been grounded for the 2013 Air Show season due to Sequestration. 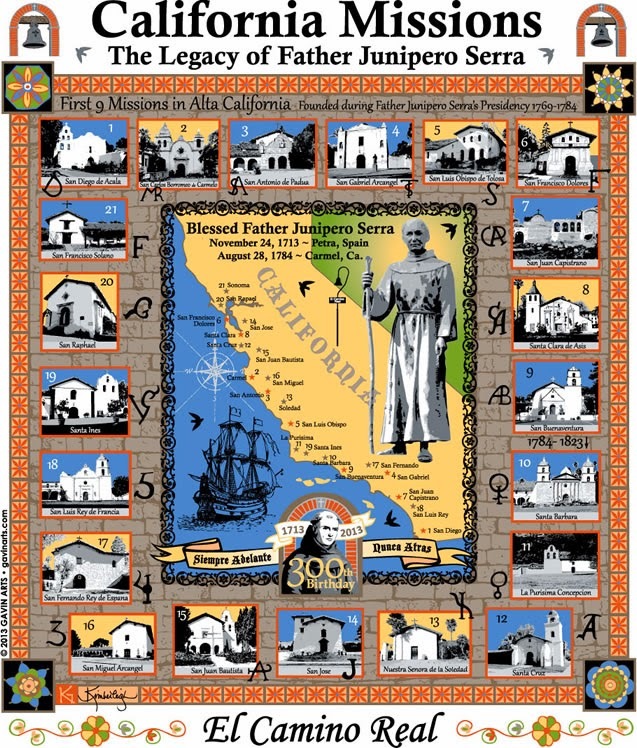 Kimberleigh Gavin and her "California Missions: Legacy of Father Serra"
Kimberleigh Gavin is at the Huntington Library's "Junipero Serra and the Legacies of the California Missions" with her Fr. 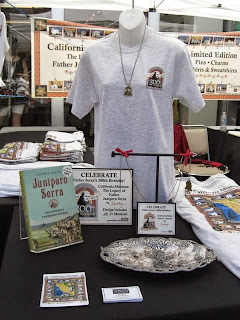 Serra 300th Birthday "California Missions: Legacy of Father Serra" T & Sweat shirts, pins & charms Saturday and Sunday August 17 & 18, 2013. Kimberleigh is a docent at Mission San Juan Capistrano and created this design that features all 21 Missions in honor of Fr. 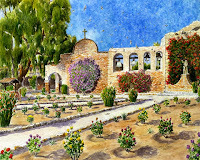 Serra's 300th Birthday and has also created designs for the Mission San Juan Capistrano Return of the Swallows since 1993. If you can't make it to the Huntington to see the exhibit and Kimberleigh, order your Fr. 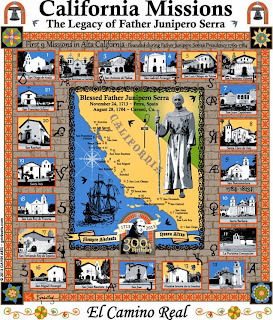 Serra 300 "California Missions: Legacy of Father Serra" items on line. EAA Ford Trimotor 2013 Oshkosh AirVenture left engine on landing. That is the propeller just to my left less than a foot from my window. I sat in the first seat on the left behind the pilot. 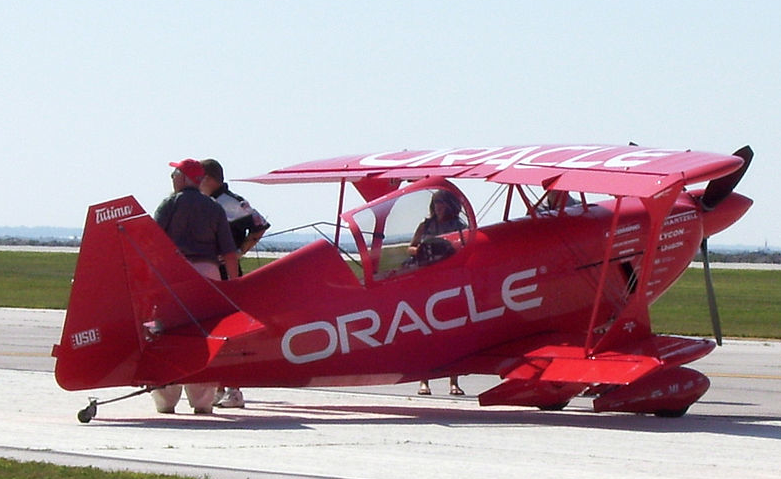 The plane was built in 1929. This airplane was the first aircraft owned by Eastern Airlines and was one of the first passenger airliners. one seat on each side of the plane - carries 10 people - crossing the country. Think about this this next time you have a problem on a trip. As I looked at this propeller I was lad parts are still available - and that these are new. P51 Mustangs fly overhead as I write - this was our first documentable sighting of the 2013 EAA AirVenture at Oshkosh event grounds. We passed it yesterday on our way into town and will be heading over to the event now. 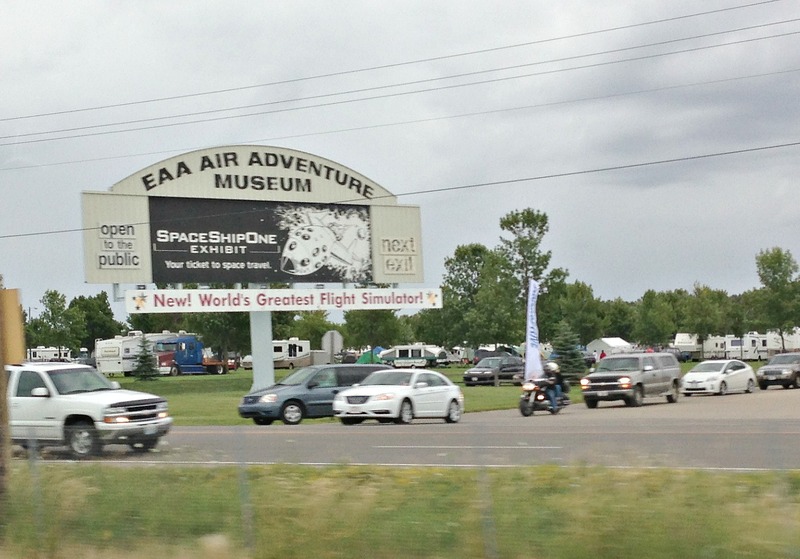 Excited to see Kimberleigh's official EAA 2013 AirVenture t-shirts on display. Also want to get back home and finish the new Dana Point painting... it is so close. The 2013 EAA AirVenture Event T-shirt design was finished too late to be made into an Official 2013 AirVenture Event Poster however the Artists are considering creating custom and very high quality 11" x 14" giclee art poster prints for $80.00 that can be easily framed in pre-cut mats and frames available at your local frame shops. Are you interested? Email info@GavinArts.com and let us know. A reminder that I and my new 25th Anniversary Dana Point Harbor Painting will be at Jon's Fish Market in the Harbor today, July 27 4-7 PM. 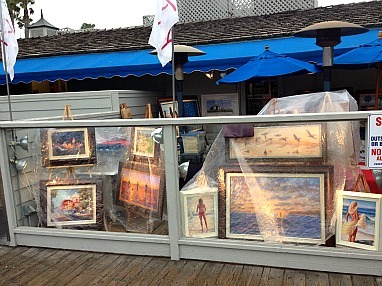 This is going back to my roots as that is where I displayed my first Dana Point Harbor piece back in 1988. Come by and see me and the new piece. Kimberleigh designed the 2013 EAA Oshkosh AirVenture event t-shirt & Paul will be heading to Oshkosh Sunday morning to attend the first three days of the event to get more ideas for possible future designs. It will be an exciting event and there will be much to see. Although we have been to many air shows across the country over the last twenty (20) years, this is the "Mother of All Air Shows" and there will be more different and interesting aircraft than I have ever seen. 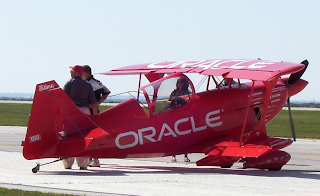 It is the Experimental Aircraft Association's event, the world's largest gathering of warbirds, aerobatics, ultra-lights, vintage and of course experimental home built aircraft - and more. 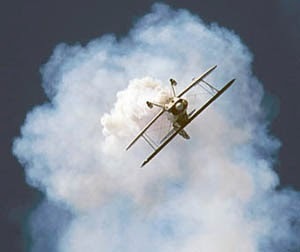 If you are an aviation buff check back to see what I may blog and check our site for any other aviation related posters or wearables you may like to purchase. 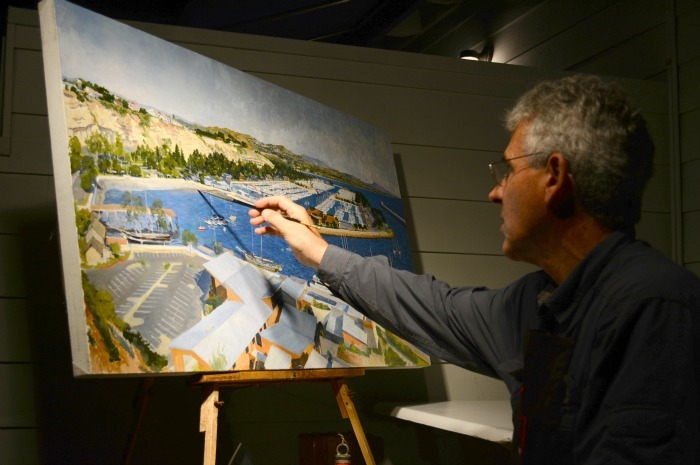 Artist Paul Gavin is finishing his 25th Anniversary Painting of Dana Point Harbor and reproductions will soon be available. The new piece is an oil painting and like his watercolor painting Dana Dreams: An Endless Summer, the first of his Premier Coastal Series completed in 1988 the view is from above the Orange County Marine Institute looking across the Harbor toward's Dana Point, Capistrano Beach, and San Clemente with Marine Corps Base Camp Pendleton in the distance. However much has changed since then and the new piece shows them. The Marine Institute has been completely rebuilt and Brig Pilgrim, the Spirit of Dana Point and the R/V Sea Explorer are visible in the foreground. The harbor is alive with stand-up paddle boarders - (see Paul's Three Wise Men) (that have replaced the 1988 wind surfers) launching from Baby Beach - or Mom's Beach. Because it is an oil the new painting is also much brighter than the original Dana Dreams; the medium enables much stronger sense of light and life. 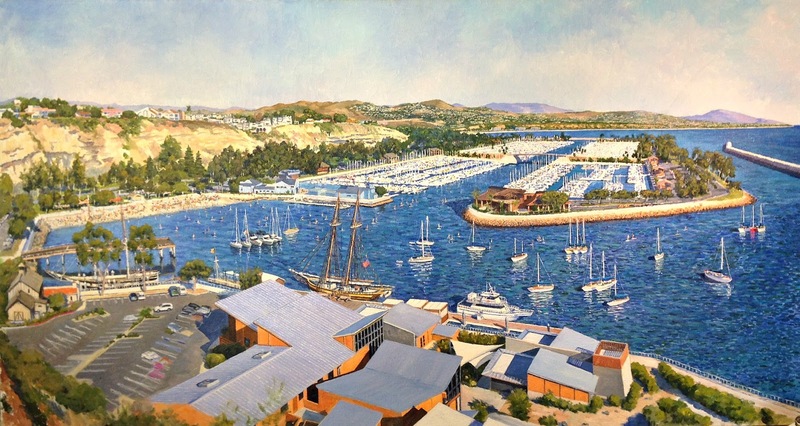 This new oil painting of the Dana Point Harbor also has a great story. Paul actually started it back in 1989 as part of project for another client but circumstances prevented his finishing it. Then this year one of Paul's clients Dana Point resident Steve Muller discovered the painting in his new building. He new Paul's work and that it was not finished and that it was the old harbor so brought it to Paul and asked if he would complete it. The timing was perfect as it also coincides with the upcoming 25th Anniversary of the City of Dana Point. Giclee reproductions of this image will be available in about three (3) weeks. Are you interested in one? Check back soon or better yet email Paul and Kimberleigh at info@GavinArts.com and get on the release list. 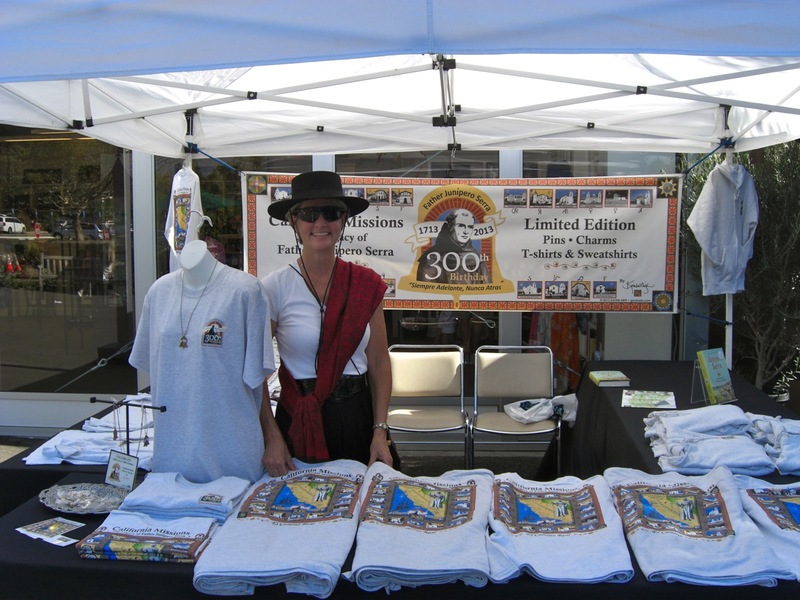 The 2013 San Clemente Chamber of Commerce Fiesta T Shirts are printed and now available. Featuring Kimberleigh Gavin's creation the "Queen of the Surf Guitar", it is a bright and beautiful piece reminiscent of the great rock posters of the 60's and 70's. Today, Sunday July 7 Kimberleigh has them at the First Sunday of the month San Clemente Village Art Fair and is in front of the new Russell's Stationers at 136 Ave. Del Mar where she will be each first Sunday for the next few months with this and other designs. The Fiesta Shirts sold out early last year so order yours today. 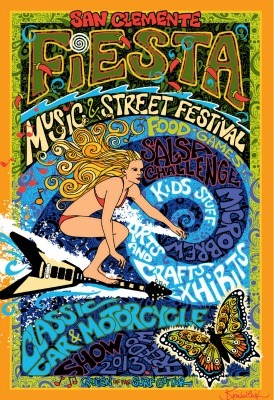 Better yet, come get yours today at the Village Art Fair on Del Mar and meet Kimberleigh and have her sign it for you! 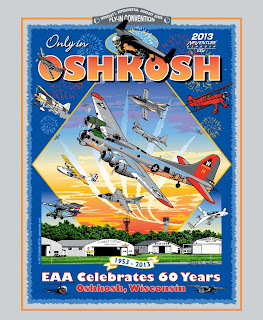 The Official 2013 60th Anniversary EAA Oshkosh AirVenture Fly In Air Show Event T Shirt Design was created by the MCAS Miramar Air Show T-Shirt and Poster artists Kimberleigh & Paul Gavin who are Gavin Arts. Paul displays his art at the Fisherman's Restaurant on the San Clemente Pier. 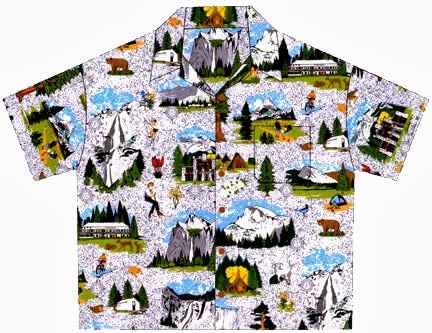 Kimberleigh is the fabric and T-shirt design genius. 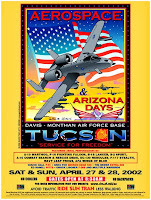 The Gavin’s first aviation related co-creation was the 1993 MCAS El Toro AirShow and since then they have designed over 100 award winning event specific images for events including the MCAS Tustin LTA Blimp Hangar Open House, Chicago Air and Water Show, Joint Service Open House at Andrews AFB (now Joint Base Andrews), the Aerospace and Arizona Days at Davis-Monthan AFB, March ARB Air Show and the SanFrancisco, San Diego and New York City Fleet Weeks. Kimberleigh also designs the Father Serra 300th Birthday California Missions Shirts and the Mission San Juan Capistrano Swallows Day Shirts and Posters. 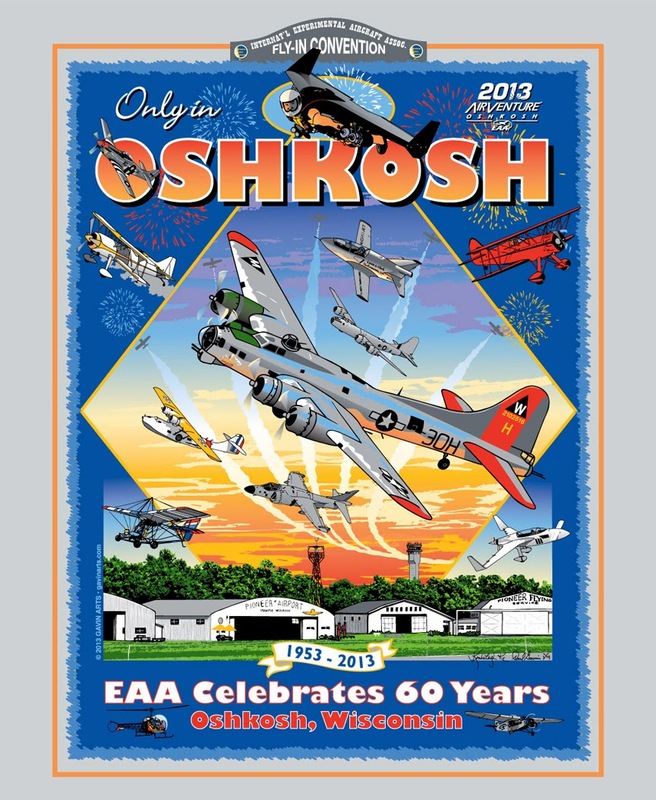 This 2013 60th Anniversary EAA Oshkosh AirVenture Fly In Air Show Event T Shirt Design features classic EAA Aircraft including the B17 "Aluminum Overcast", 2013 AirVenture performers, an aircraft for each EAA category, and the Historic Pioneer Airport. 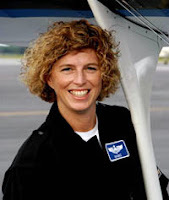 Support General Aviation and the EAA Scholarship program. Order yours now! 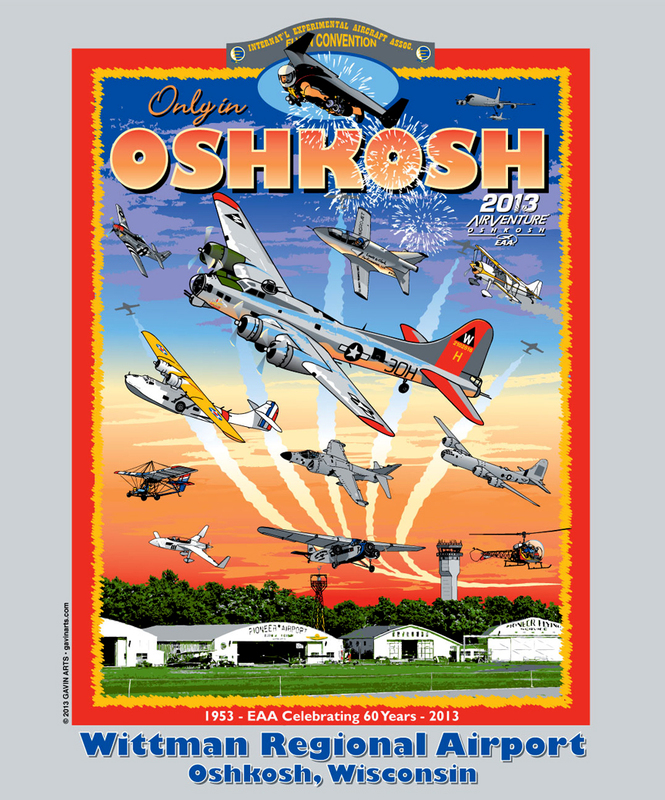 Paul will be at the 2013 EAA Oshkosh AirVenture July 29 - 30 to sign shirts. Today is the San Clemente Car Show. Last year DDAY JP and I attended. 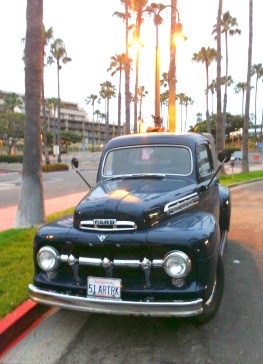 But but this year 51 ARTRK & I will be at the San Clemente Pier Art Display on this beautiful Marine Layered Morning. It looks like it might actually break; a little light up high. But it looked that way yesterday and it was overcast all day. Still a great place.... It is misting now, however; hopefully it will not increase as it did last week when the art all had to be covered in plastic.